THE Dream Quilter™ 15 was crafted with all of the high-end long-arm features you desire in a truly affordable quilting machine. The extended workspace gives you the freedom to quilt larger patterns or blocks. This machine boasts superior stitching with built-in stitch regulation, and four types of stitch modes to choose from. THE Dream Motion™ Pro Software allows for the ultimate quilting experience for all levels of quilters from beginners to professionals. With an intuitive layout and easy to use features, create, design, edit layout and quilt with absolute precision. Tablet shown is not included. Exclusive feature: Zone-to-zone fabric management to transition patterns seamlessly across your quilt. THE Dream Fabric Frame , the ultimate accessory that will revolutionize the way you create using a wide selection of Brother-built machines. *Includes SAQCFSK1 Dream Frame Starter Kit, THE Dream Fabric Frame with a FREE SAQCFSK1 (Dream Fabric Frame Starter Kit:) MSRP $99.00. Kit Includes: top & bottom fabric with batting, 10 pack quilting needles, 4 spools cotton quilting thread. 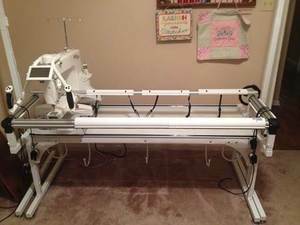 Dream Quilter™ 15 DQLT15 15" Mid-Arm Quilting Machine: THE Dream Quilter™ 15 was crafted with all of the high-end long-arm features you desire in a truly affordable quilting machine. The extended workspace gives you the freedom to quilt larger patterns or blocks. This machine boasts superior stitching with built-in stitch regulation, and four types of stitch modes to choose from. 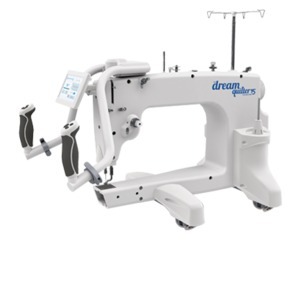 Features such as the large M-class bobbin, automatic bobbin winder, laser stylus and the Brother exclusive custom grip handles with rotating capabilities that allow for more control closer to the fabric make quilting a breeze! Mr. John, Wanted to let you and Barbara that the machine went together with no problems. It is up and running. Thanks again for the advice on assembly. Archie C.